The sports minister of Sri Lanka has accused the national Olympic Committee of failing to follow his advice to send personal coaches together with the country's Olympic athletes. Minister Mahindananda Aluthgamage also dismisses the accusation by the team captain Niluka Karunaratne that the authorities did not allow his coach to come to London despite requesting to do so as "a total lie." Seven sportsmen and women are representing Sri Lanka at London 2012 Olympics. More than ten officials have travelled to London together with the team but none of them is a coach. As marathon runner Anuradha Indrajith Cooray is based in UK he is the only Sri Lankan whose coach Nick Taylor is in the Olympic Village. Hurdler Christine Merrill, shooter Mangala Samarakoon, swimmers Heshan Unamboowe and Reshika Udugampola, badminton player Thilini Jayasinghe and marathon runner Anuradha Cooray are the other members of the Sri Lanka team. "I told the Olympic Committee to allow Niluka's father to travel to London. I also advised the shooting association to send Mangala Samarakoon's coach but I was told by the OC that it was too late as they have already sent the list," Minister Aluthgamage told BBC Sinhala service. Samarakoon, who failed to qualify for the second round with 585 points, told the BBC that he would have performed better if his coach was allowed to travel with him. Marathon runner Cooray, who agrees, said it is important for any athlete to have his or her coach around when they are competing in an important event such as the Olympics. "We might have finished our training but it is the coach who knows your strength and mistakes. And not only physical strength but they also look after our psychological well being," Cooray told BBC Sinhala. The head of Sri Lanka's Olympic Committee, Hemasiri Fernando, however, says that it is not important for the coach to be present in London as all of them have completed their training before London 2012, but the minister disagrees. "I don't accept that, it is wrong. The coach should be with the player up until the last moment," said the minister, adding that he has ordered an explanation from the Olympic Committee about the team of officials sent to London. Meanwhile, captain Karunaratne, who reached for the badminton quarter-finals by beating world number eight Japan's Kenichi Tago, has told Sri Lanka's Lankadeepa newspaper that he requested his father, Louvi, to be allowed to travel to London as his coach but it was not allowed by the authorities. "It is a total lie," the minister said. "I advised Niluka to take his coach with him but it was Niluka who wanted to take his sponsor, Mr Rohan with him." 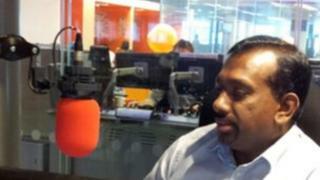 Rohan de Silva is in London 2012 as the manager of Sri Lanka's two-member badminton team that includes Thilini Jayasinghe. "And the ministry paid for the air tickets of Niluka's father and the president of the badminton association, Parakrama Basnayake," Minister Aluthgamage added. None of the Sri Lankan players qualified for a final of any of the events in which they took part although Cooray is still to run in Sunday's marathon. Sri Lanka has only ever won two Olympic silver medals; Susanthika Jayasinghe's bronze in the women's 200m in the 2000 Sydney Olympics was later upgraded to silver after American Marion Jones was stripped of her title for taking drugs. And at the last London Olympics in 1948, Duncan White won silver at the men's 400m hurdles.